The Haughton impact crater is a research site for numerous scientists working toward lunar and mars exploration. Spaceagencies around the world have been gearing up for the return of humanexplorers to the moon by developing fantastic new technologies. From roversto rockets, these technologies are necessary for transportingastronauts to the moon and for performing surface geology and biologyexperiments. As the prospect of a renewed human presence on the moonapproaches, it may be time to think about how our scientific priorities at the moonwill best be achieved. These arethe issues being discussed by a group of researchers working in the CanadianArctic. The team recently published a study in the journal Planetary and SpaceScience about the lessons they have learned while performing fieldscience in an impactcrater ? and how these lessons could be used to provide guidelines forhumans working on the lunar surface. TheHaughton impact structure is located on Devon Island in Canada's NunavutTerritory. Haughton is the only crater known on Earth that lies in the polardesert. Its frigid, high arctic environment has made it a hot destination forspace scientists wanting to try out the latest fashions in spacesuit design andexplorationtechnology. Since 1997,scientists have regularly used the site to test equipment and perform detailedgeological and biological studies. Haughton is also the location of theFlashline Mars Arctic Research Station, where crews simulate living and workingin a model Martian habitat. The onlydirect experience we have in human surface operations on the moon comes fromthe six Apollo lunar landings. These missions provided valuable experience, buta lot has changed since the last Apollo landing in 1972. The instruments thatscientists are now able to take into the field are much smaller and morepowerful. Future explorers will also spend far more time on the moon. NASAhopes to achieve regular missions of 180 days in length. This means that futurelunar explorers have the potential to perform much more complicated anddetailed science investigations. Because impact craters are a dominant featureof the lunar landscape, locations like the Haughton impact structure areessential practice sites for expanding our knowledge of how surface explorationwill best be conducted by astronauts on moon. The authorsof the recent study spent five successive field seasons systematicallyexploring Haughton crater. They visited sites throughout the crater bysimulating extra-vehicular activity (EVA), and collected numerous samples,photographs and other scientific data. Each excursion was planned using remotesensing data to identify points of interest. The resolution of remote data wasnot fine enough to identify specific outcrops and structures of the crater insmall scale. Instead, remote images helped identify large-scale features, suchas drainage patterns, and potential obstructions, such as steep cliff walls.This proved to be a good analog for lunar exploration, where data from remotesensing will be used to define general areas for exploration, while thesmall-scale points of interest will be discovered and sampled by astronauts asthey traverse the surface. Accordingto lead author, Gordon Osinski, "Many of the high priority scientificquestions driving lunar exploration require samples to be brought back toEarth. We absolutely have to conduct surface science to collect these samplesand understand their context if the laboratory work on Earth is to meananything." In order todetermine the most efficient way to carry out science on the lunar surface, theresearchers turned to their knowledge of scientific methods practiced by fieldgeologists on Earth. From this perspective, human exploration of the moon canbe broken down into three phases. First comesreconnaissance. This initial phase uses remote sensing and topographic data toidentify potential regions of scientific interest, saving time and resources.The expense of getting to the moon and the danger involved mean that astronautscan't just simply go for a walk in the hopes they?ll come across somethinginteresting. For the Haughton study,this phase raised more questions than answers. "This is very much howexploration and field geology work," says Dr. Osinski. "You often gointo the field for the first time with some very simple hypotheses. Unexpecteddiscoveries often result in new questions. In fact, you could say that thereconnaissance phase is all about finding out what we don?t know about a region,so that we can focus the subsequent systematic work on answering the reallyimportant questions." "Duringthe final days of the 1999 field season, the lead author (Gordon R. Osinski)was on a long regional traverse exploring the southern part of the HaughtonRiver valley and discovered an outcrop displaying intense alteration bysecondary minerals? These minerals were only present on a fresh verticaloutcrop that was not observable on any remote sensing dataset." theauthors of the study report. Planningahead for exploration using remote sensing data is important ? but if explorershappen upon sites of specific interest, it is also important that they are ableto change their plans to take advantage of their findings. This is an importantconsideration for the moon, where flexibility will be limited by the equipmentand resources (such as oxygen) that astronauts are able to carry into thefield. Barring anyspecial, unexpected finds, the main goal of collecting samples during thereconnaissance phase is to simply get a general representation of the types ofgeological material present in the area. This allows geologists to identify key'science supersites' that warrant more visits. The secondphase is systematic region-scale mapping and sampling. After gaining a generalfamiliarity with the region and examining a broad collection of samples,astronauts will then have a better idea of specific sites that need to berevisited for further study. Another important part of this phase is to developsystematic and detailed geological maps. These maps are more detailed thanthose produced by remote sensing, and are essential for placing any scientificfindings in the true context of their surroundings. Accordingto the authors of the study, "It will only be through detailed mappingthat we can be sure, for example, that a collected sample is from the ejecta ofthe target crater and not from another distal basin-forming impact." The endgoal of phase two is a systematic and more detailed understanding of theregion. This means that more data and samples will be collected than was gatheredduring the reconnaissance phase. Because of this, astronauts will need moresupplies, equipment and sample storage facilities. The finalphase of surface operations on the moon is detailed local-scale mapping andsampling. 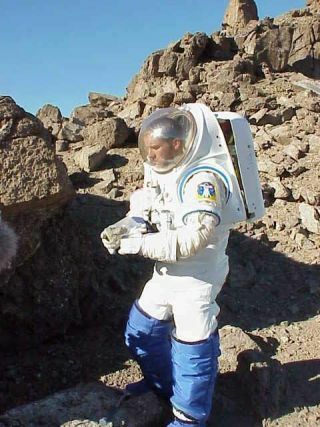 During this phase, astronauts will concentrate on returnvisits to key sites where they will collect specific samples and performdetailed research. "Oneof the major obstacles to conducting geology on the moon is the rarity of'outcrops' - rocks that are in place and undisturbed," according to Dr.Osinski. "Much of the moon?s surface is regolith and material thrown outby impact craters, which makes knowing where a particular rock came from verydifficult. Places where outcrops occur, such as on the walls of steep canyonsor in small, fresh impact craters, will be some of the high prioritysites." Duringphase three, astronauts will spend less time traveling and more time collectingdata. According to the authors, "There is a greater emphasis during thisphase on formulating scientific questions before the field season and detailedplanning of traverses." This includes careful planning of routes to reducetravel times and maximize the amount of time that explorers can spend at majorpoints of interest. Throughtheir experiences exploring Haughton crater, the research team developed a listof lessons for mission planners working on lunar exploration. First, missionplanning must allow for flexibility in order to take advantage of serendipitousdiscoveries. This may be the most important recommendation resulting from theHaughton study. Interviews with Apolloastronauts also highlighted the need for flexibility on future lunarmissions. Accordingthe authors, "it was suggested that the crew should play a far more activerole in planning and executing their activities and that these missions shouldnot be as tightly scheduled as Apollo." Interaction between the crew andEarth-based support is still important, but "interaction with a ground advisorshould be very much on a 'crew request' basis and not the other wayaround." Lunarexplorers will also require a rugged but simple human operated rover. The workin Haughton crater indicates this is an essential piece of equipment. Multiplerovers may be needed for redundancy, and would allow explorers to safely travelfurther from the habitat. Remote 'field camps' could also increase the distanceat which EVAs could be taken. These would provide a place for explorers toreplenish supplies, such as water and oxygen, when they are running low and aretoo far from the habitat to make it home safely. The lessonslearned from Haughton also provide insight into requirements for lunarhabitats. Explorers on the Moon will need sufficient laboratory space insidethe habitat so that they can easily interact with and study samples. Adequatespace must also be set aside for storing samples, both in the habitat and onthe rovers. Finally, a 'sample shed' will be required so that scientists have aplace where they can screen samples and prioritize them for further study inthe laboratory. "Somefield geologists may consider many of these finding to be unsurprising or'common sense'; however, we believe that this kind of study is important toinform mission planning," the authors write. "By conducting sciencein an analog environment on Earth, we can learn how to conduct fieldwork beyondthe Earth."